This article by Robert Loerzel originally appeared in Pioneer Press on April 29, 2010. 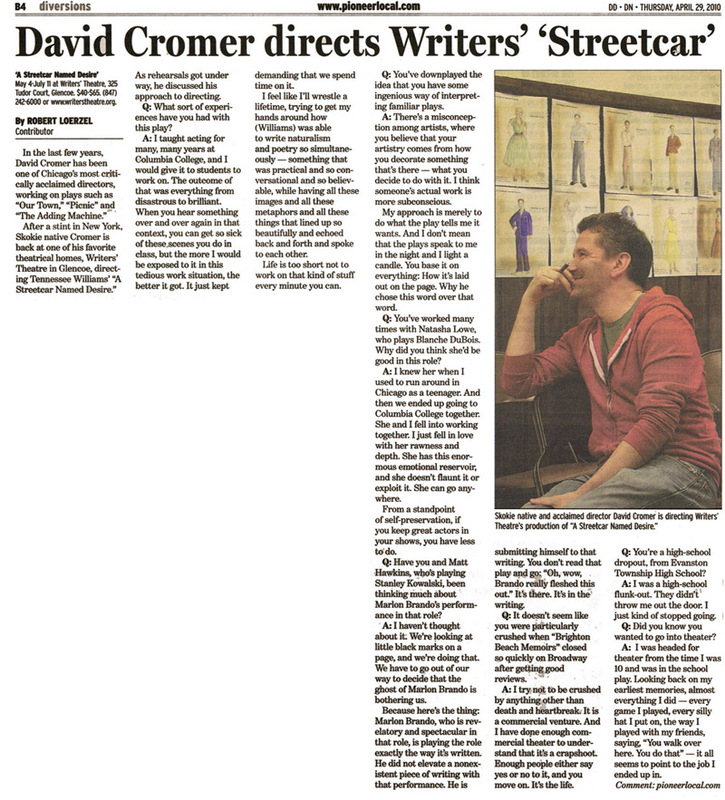 After a stint in New York, Skokie native Cromer is back at one of his favorite theatrical homes, Writers’ Theatre in Glencoe, directing Tennessee Williams’ “A Streetcar Named Desire.” As rehearsals got under way, he discussed his approach to directing. Q: What sort of experiences have you had with this play? A: I taught acting for many, many years at Columbia College, and I would give it to students to work on. The outcome of that was everything from disastrous to brilliant. When you hear something over and over again in that context, you can get so sick of these scenes you do in class. … But the more I would be exposed to it in this tedious work situation, the better it got. It just kept demanding that we spend time on it. I feel like I’ll wrestle a lifetime, trying to get my hands around how (Williams) was able to write naturalism and poetry so simultaneously — something that was practical and so conversational and so believable, while having all these images and all these metaphors and all these things that lined up so beautifully and echoed back and forth and spoke to each other. Life is too short not to work on that kind of stuff every minute you can. Q: You’ve downplayed the idea that you have some ingenious way of interpreting familiar plays. A: There’s a misconception among artists, where you believe that your artistry comes from how you decorate something that’s there — what you decide to do with it. I think someone’s actual work is more subconscious. My approach is merely to do what the play tells me it wants. And I don’t mean that the plays speak to me in the night and I light a candle. Just, it’s there. You base it on everything: How it’s laid out on the page. Why he chose this word over that word. Q: You’ve worked many times with Natasha Lowe, who plays Blanche DuBois. Why did you think she’d be good in this role? A: I knew her when I used to run around in Chicago as a teenager. And then we ended up going to Columbia College together. She and I fell into working together. I just fell in love with her rawness and depth. She has this enormous emotional reservoir, and she doesn’t flaunt it or exploit it. She can go anywhere. From a standpoint of self-preservation, if you keep great actors in your shows, you have less to do. Q: Have you and Matt Hawkins, who’s playing Stanley Kowalski, been thinking much about Marlo Brando’s performance in that role? A: I haven’t thought about it. We’re looking at little black marks on a page, and we’re doing that. … We have to go out of our way to decide that the ghost of Marlon Brando is bothering us. Because here’s the thing: Marlon Brando, who is revelatory and spectacular in that role, is playing the role exactly the way it’s written. He did not elevate a nonexistent piece of writing with that performance. He is submitting himself to that writing. You don’t read that play and go: “Oh, wow, Brando really fleshed this out.” It’s there. It’s in the writing. Q: It doesn’t seem like you were particularly crushed when “Brighton Beach Memoirs” closed so quickly on Broadway after getting good reviews. A: I try not to be crushed by anything other than death and heartbreak. It is a commercial venture. And I have done enough commercial theater to understand that it is a crapshoot. … Enough people either say yes or no to it, and you move on. It’s the life. Q: You’re a high-school dropout, from Evanston Township High School? A: I was a high-school flunk-out. They didn’t throw me out the door. I just kind of stopped going. Q: Did you know you wanted to go into theater? A: I was headed for theater from the time I was 10 and was in the school play. Looking back on my earliest memories, almost everything I did — every game I played, every silly hat I put on, the way I played with my friends, saying, “You walk over here. You do that” — it all seems to point to the job I ended up in.